This project has been developed with the help of leading tour operators, hotels, transport and airline companies of Moldova. We have specialists that studied and worked in this field across Europe and USA. The creator of this project has extensive experience in tourism, worked in many countries. Head-office of the project is in Leipzig (Germany). "Hotels.md AIR" - agency for selling air tickets for internal and international flights. "Hotels.md LAND" - agency that has bus routes to Hungary, Germany, Spain, Italy, France, Belgium, Portugal. "Hotels.md TOURISM" - tour operators that cover over 20 countries: Romania, Bulgaria, Ukraine, Russia, Switzerland, Italy, United Kingdom, Germany, France, Czech Republic, Montenegro, Croatia, Turkey, Brazil, Mexico, Peru, Bolivia, Venezuela, Kenya, UAE, Egypt, Thailand, Malaysia, Indonesia, Singapore, China. 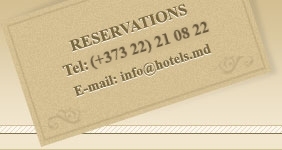 And last but not least "Hotels.md MOLDOVA". If You appreciate high quality service and reasonable prices - entrust "Hotels.md" with the planning of Your trip. You will visit places that You wouldn't be able to visit by Yourself, You will be protected juridically and physically, You will have enough time for recreation. Our personnel will pick, recommend the best there is in Moldova. We are a company of a new type, offering a wide-range of services. Our company is present on the undeveloped market for 10 years. Some of those that started working same time as we did couldn't handle the hardships of the market, because of that they changed the sphere of their activity. We persisted, we remained. We work hard, sometimes without breaks and holidays. We have gathered a strong team of experienced and devoted people. Many were fired, even top-positioned workers during the rush season. An unreliable and unstable worker is a stain on our company's name. He will drown himself and take others with him - that's just a matter of time. We are very demanding with our partners - transportation companies, hotels, operators, agencies. We are not afraid of conflict situations - better no partner than an unreliable one. Our clients are top-priority, that's why we are ready to take measures if someone doesn't respect their duties. Our priority is to fulfill our client's desires. We respect them, we see people in them, not means of profit. Admit it, this attitude is rare. We meet a lot of pleasant people. Of course we also meet difficult clients. The client should not forget that we are an tour-operator that serves incoming tourists, we are not a housekeeper or a personal driver. Regardless the money that the client pays, it does not give him the right to treat our personnel in any different way. The name or the position of the client is not an excuse for abuse and disrespect towards our personnel! Our foreign partners say that we are the only company in Moldova that can be entrusted with a tourist and not worry about his trip. This is true, even though it sounds flattering. Our main client is the businessman on a business-trip. Our prerogative is to assist him in all possible ways, so that waste of time and money is avoided. We become our client's friends, friends in a foreign country. We show and tell everything that worths knowing. We look after our client, we shield him from dubious, untrustworthy places and people. We love our country, and we want to share this love with You. Visit us - You will enjoy Your trip. We'll make everything possible for that.